I was at the 7-11 around the corner from my house. I had just made a purchase and was heading to my car. I passed a group of teenagers on my way. They were congregated near the parking lot. They looked like part of the popular crowd. You know, those kids you always wanted to hang with. They were laughing and smoking. As I paused at my car door, they moved on. But I looked on the ground and noticed that one of them had dropped a word. I looked around, but they were too far away now to be bothered and I didn’t want to encourage any unneeded attention from those who could probably be so cruel toward a mature nerd. So I scooped the word into my pocket and climbed into my car. Once in the safety of my vehicle, I pulled the word out and inspected it. Then it dawned on me. This word could make me relevant. Used responsibly, it could raise my social status. Why should all of the really hip words belong to the cool kids? I would make this word mine. And I would use it whenever possible. It would be especially helpful with people I barely knew. It would steer their opinion of me to my favor. So I headed home, trying to figure out a way to premiere the word on my wife. I didn’t have to go very far before I found a reason to use it; I was wearing the new shirt she had bought for me. And this word would fit very nicely with that. I smiled craftily as I drove. It was the perfect plan. Once inside my house, I helped with some minor chores as I contemplated my delivery of this word. These things had to be done delicately. My wife commented on the shirt, and I saw my opportunity. She was making this too easy for me. “That’s my SWAGG, baby,” I said. My wife paused. She dropped a plate that she had been guiding from the dishwasher to cabinet. It smashed into a million pieces. She looked at me, searching for the man she had married. She was appalled by my proclamation. I suddenly felt like that kid in a just say no commercial. Then I felt foolish and old. The word had sat upon me like an ill-fitting toupee. I had been betrayed by a wag with an S in front of it and an extra G behind it. What a silly word to fall to. I turned and rushed out the door, my wife calling frantically behind me. I didn’t know where I was headed. I only knew that I had to get away. I ran down the dark street, hot tears streaming down my cheeks and blurring my vision. I found myself back at the 7-11. Those kids had returned. I walked up to them, my eyes staring at the ground. 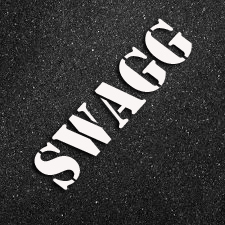 “Here, you dropped this,” I said, handing the word SWAGG back to them. It was theirs to keep. I wanted no part of it anymore. As I turned to leave, I could hear them quietly mocking me. “You shouldn’t smoke. It’s not cool, man,” I called over my shoulder. I went back home. I had deadlines and I met them, because that’s what writers do. Even if their hearts have been broken by the words they usually call friends. My wife forgave me, because that’s what people who love you do. But I know it still haunts her. That night I made a solemn pledge to never use that word again. And I haven’t.